This is the first Dirk Pitt novel I've read in years. I may have mentioned that I grew up with books - my own, my dad's, mom's and even my brother's. Even when I was in gradeschool and highschool, I remember reading books that my dad bought for himself. You see, with the exception of my chick lit purchases, most books here are common property - everyone reads them (I think my mom reads chick lit now too). 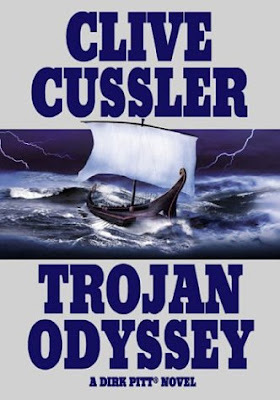 My dad was a Clive Cussler/Dirk Pitt fan and to no surprise, the whole family got hooked. The first time I paid attention to Dirk Pitt, if I remember correctly, was when we vacationed at Hidden Valley Springs (oh my God, it must have been when I was around 9 or 10 - we went there several times) and my brother rented a video - Raise the Titanic! It was the movie adaptation of the Dirk Pitt adventure. When we went home, I gave reading the thick novels a try and I found that I actually liked them. So two weeks ago, I picked up Trojan Odyssey along with several other books at the small bookshop in our building. I was surprised to learn about Dirk's grown kids! So apparently there's at least one other Pitt novel out there that we haven't read before (Valhalla Rising) because the appearance of Summer and Dirk Jr was a big surprise. The book gave me my dose of adventure, world history and mythology. Sometimes I really think that I didn't major in the right subject in college. Why didn't I study literature or archeology or even art history? Okay, they wouldn't have suited me either. Hehe. It was very interesting to read about the battle of Troy and Odysseus' trip home to Ithaca and learn of other theories behind what or where it really happened. It was amazing how Cussler was able to tie in that story with what Specter was really all about. Truly genius. I recommend this novel to anyone looking for an adventure though if you don't know Dirk Pitt yet, I would suggest starting with the other novels because you got to have read other Pitt novels for you to really appreciate the talk of retiring and even of settling down with Loren. These novels really do a good job raising environmental awareness, specifically consciousness of marine life which I don't think gets the attention it deserves in this country. I had a Lit class held at the Marine Science Institute building in campus (because there were no other rooms available elsewhere) and that was the closest I ever was to Marine Science. Maybe in another life I'd take up Marine Science or something.